I believe I've mentioned before that I'm not a lover of brownies. Don't get me wrong, brownies are fine, but some people obsess over them (my brother, for example). 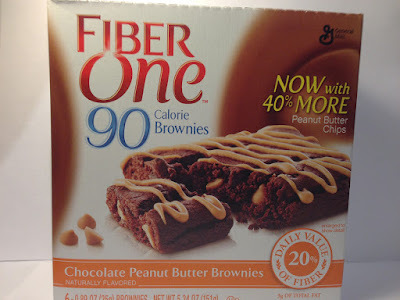 That said, despite my lack of obsession for brownies, I've been more than willing to try them out in Fiber One reviews for the blog and I've found them to be pretty darn good. It's that successful track record (and a sale) that leads me to try out one of Fiber One's new brownie products with this review of the Fiber One 90 Calorie Chocolate Peanut Butter Brownies that I picked up on sale in a box of six at Meijer for $3.00. Each brownie weighs 0.86 ounces and is obviously 90 calories. 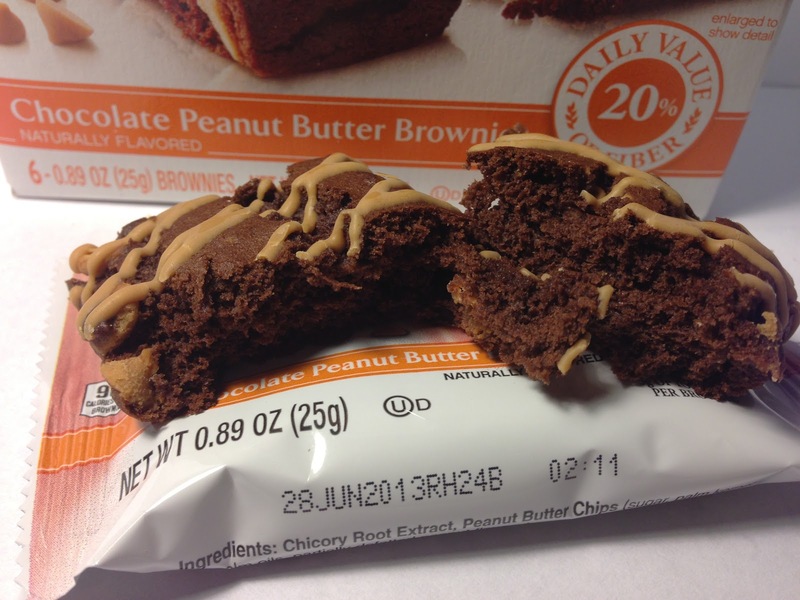 It's got a lot of fiber and if you read the box, it's now got 40% more peanut butter chips! Like a nerd, I've got to admit that the garish advertisement of 40% more peanut butter chips kind of excited me, so when I broke this in half and took a look, I was wondering how few chips there were when there were 40% less because there weren't very many in the brownie now. They were in there, but there were only maybe a handful or so. That was kind of disappointing. As for the rest of the brownie, it was just a typical brownie with a peanut butter swirl on top for added an added peanut butter component. The brownie had that nice smell mix of chocolate and peanut butter, so that definitely made it appealing to my nose before I took my first bite. Also, this was roughly a square that was about two to three inches on each side, so that at least gives a size perspective as well. As I took my first bite (I ate it dry), I can't say I was surprised by how this tasted since I've had these Fiber One brownies before. In fact, this one was pretty much the the Chocolate Fudge Brownie that I so thoroughly enjoyed with a dash of peanut butter added and peanut butter chips instead of chocolate chips. The brownie itself was moist and what chips there were melted in my mouth when I ended up getting one in a bite. The chocolate flavor was strong and the melting peanut butter chips and the peanut butter icing brought an additional decadence to this, so while it wasn't nearly as chocolaty as the fudge brownie as you'd expect, it was just as decadent in a different way. Buy It or Fly By It? Any brownie that is decadent gets a BUY IT rating in my book. Since this is only 90 calories, it can be considered "healthy" in a way and when you use the word decadent to describe something that is supposedly healthy as well, you've got a winner. As a side note, I tried a second one of these later after heating it in the microwave for fifteen seconds or so and by doing that, the peanut butter and chips melted a bit and made this chocolate with gooey peanut butter spread everywhere, which of course just increases the decadence factor. The economics of these are horrible, but they make a nice base for an ice cream brownie sandwich -- or two. I agree. They are definitely more expensive than they seem like they should be, but they definitely are tasty.